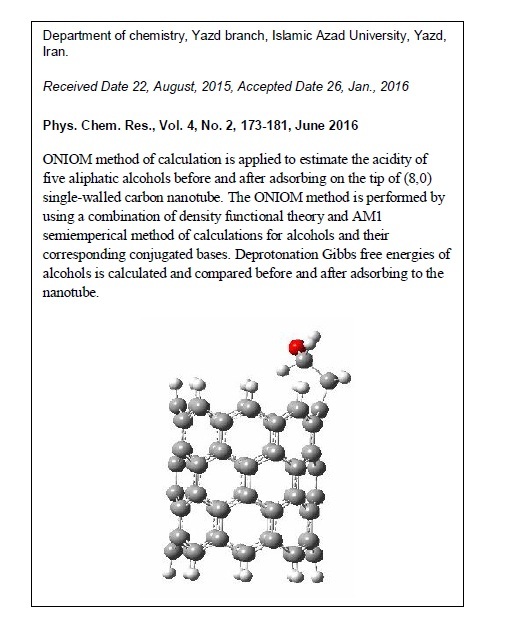 ONIOM calculation is carried out to estimate the acidity of five aliphatic alcohols before and after adsorbing on the tip of (8,0) single-walled carbon nanotube. The ONIOM method is performed using a combination of density functional theory and AM1 semiemperical method for alcohols and their corresponding conjugated bases. Deprotonation Gibbs free energies of alcohols are calculated and compared before and after adsorbing on the nanotube. Solute-solvent interactions are taken into account by employing the conductor polarized continuum model (CPCM). The results show that the acidity of alcohols change after adsorbing on the nanotubes and these alcohols have a little effect on (8,0) SWCNT.